The dosage in this oral flea medication is perfect for smaller dogs; while it won’t prevent, it will quickly kill the adult fleas on your small pup. For larger dogs, different levels of medication are necessary. This dose will get the job done. It will kill. However, it won’t protect. Soft chews are a much more pleasant way to feed medicine to your dog. We love this formula and how much dogs love it. When you have learned your dog has a flea infestation, you need to take quick action before the problem grows larger and harder to tackle. There are many different treatments available, and one of those treatments is oral medication. An alternative to topical treatments such as shampoos and sprays, oral medication is fed to your pup. The active ingredients are safe for your furry friend but highly deadly to fleas. When a flea bites a dog who has been eating oral flea medicine, they are sure to die. Below are a few of what we think are the best oral flea medications for your dogs. Read on to learn more and take action. 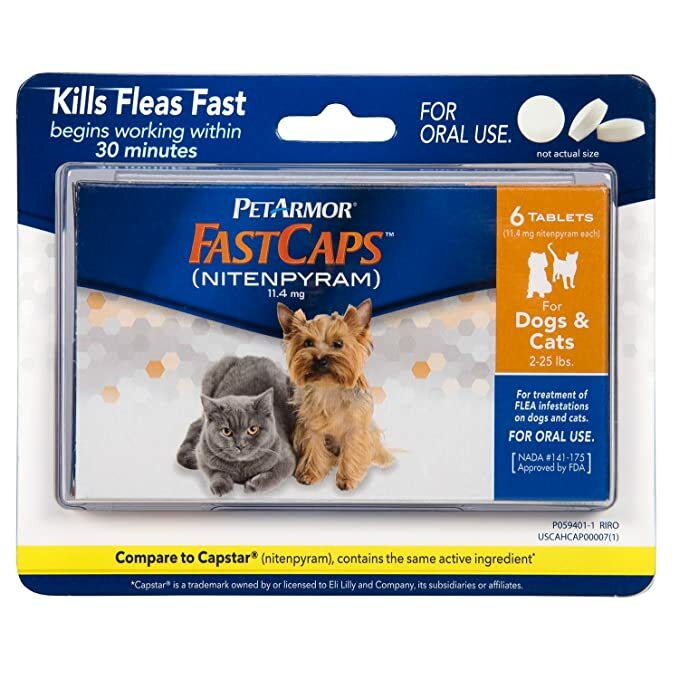 For a quick solution to a flea problem on your small dog, PetArmor FastCaps is the way to go. With just one dose consisting of one tablet, you can get rid of all the fleas on your small dog. Extremely easy to use, all you have to do is feed the tablet to your dog. The fast-acting ingredients start taking effect as quickly as 30 minutes. When the fleas bite into your treated pup, they will die almost instantly. These tablets are safe enough to use once a day if necessary, so if you are trying to clear your home of fleas, you can be confident your dog is safe. 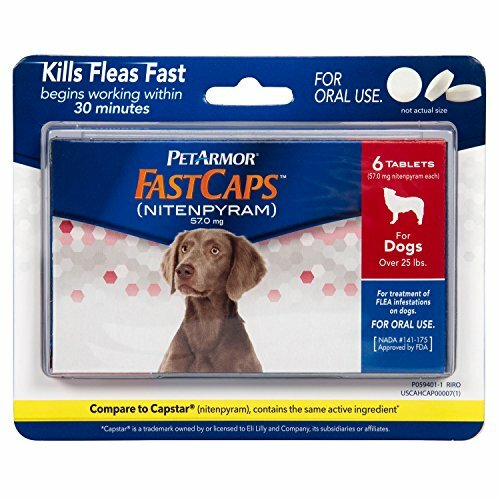 Using the active ingredient Nitenpyram, which is used in Capstar, PetArmor FastCaps for Large Dogs is an excellent solution for a flea infestation on your 25-pound or heavier dog. Just one tablet of this formula is enough to kill a flea infestation. The adult fleas on your dog with die instantly when they bite your treated pup. Highly effective, this formula is safe for pregnant and nursing dogs, older dogs, and dogs who are breeding. It’s even safe enough to be used once daily as needed. A great alternative to topical treatments, this easy fix is not messy and has no harsh smells. 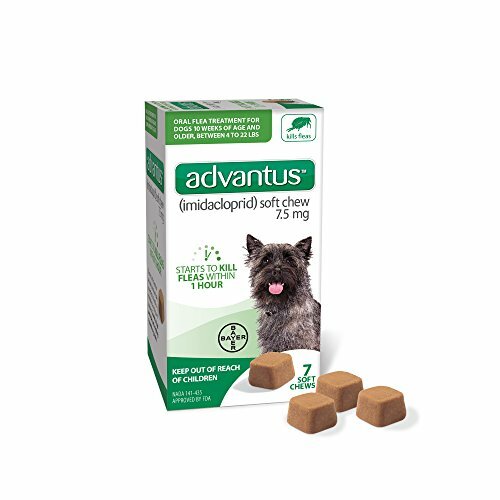 Bayer Animal Health Advantus Soft Chew for Small Dogs is a savory oral medication that tastes just as good as a treat. The great flavor makes it super easy to feed to your dog, and the effective formula will start working within an hour of consumption. This fast-working formula is available without a prescription, making it easily accessible to you. The ingredients are safe enough that you can use this treatment as much as once a day safely, as needed. It is also safe for dogs who may have an animal protein food allergy. A great alternative to hard, tasteless tablets, the Advantus Soft Chew for Large Dogs from Bayer Animal Health are tasty and easy to use. Just one dose will kill fleas quickly, beginning to take effect within one hour. 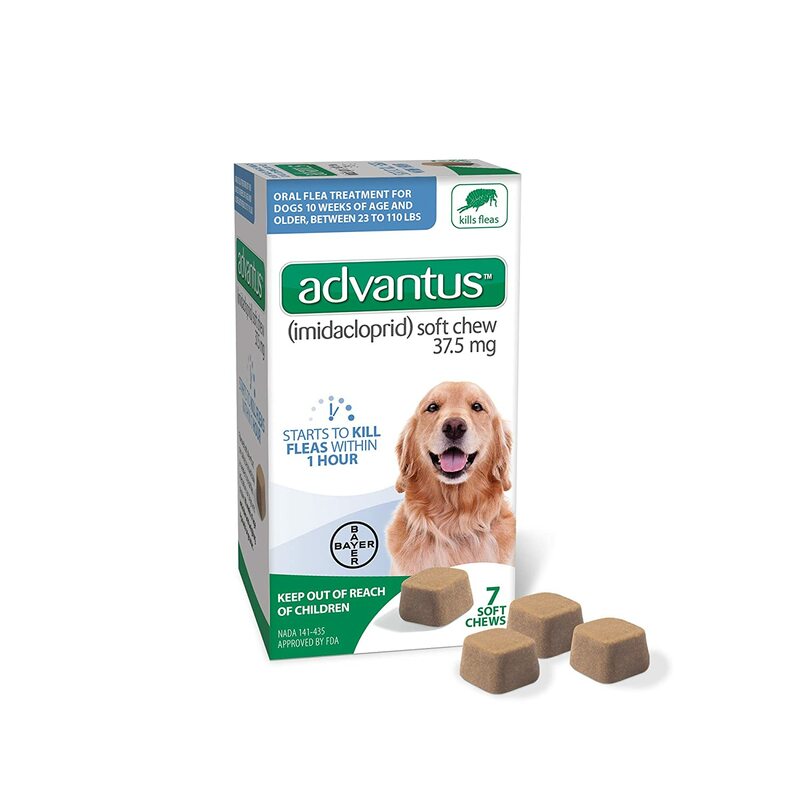 A safe solution, these soft chews can be given to your large dog as often as once every day. This makes them great for an ongoing flea solution. They also can be used in tandem with shampoos and other unrelated medications like heartworm treatments. Oral flea treatments have proven to be more effective in killing adult fleas.